If you can’t travel for a living, then work where you can torture those who do. So, all this recent air travel (I’m writing this from a hotel room right now) has prompted me to make an important and potentially life-changing discovery. I have uncovered the job I was meant to do in this life. For most of my adult life, I felt that my introverted orientation would best suit me for a career as a writer or researcher, solitary jobs where I could work with limited human contact. I once even entered library school to pursue a master’s degree in library and information science because libraries, above all else, are quiet places…peaceful places where no one is allowed to yell or run around or disturb anyone else. You see, I don’t generally care for human interaction. It exhausts me and, unfortunately, most jobs require you to interact with other people. Finding a job where you rarely have to deal with people at all is difficult because most of those jobs are already being done by other introverts who got there first. Sigh. Well, I’ve spent a lot of time in the airport recently and what I’ve realized is that I was meant to be a TSA employee. Yes. I know. Airport TSA agents encounter oodles of people each and every day. But, you know what? They don’t have to be nice to them. Most TSA agents are sarcastic, bossy, and standoffish. You know what? So am I! You know what else? The government pays them to be that way every single day on the job. 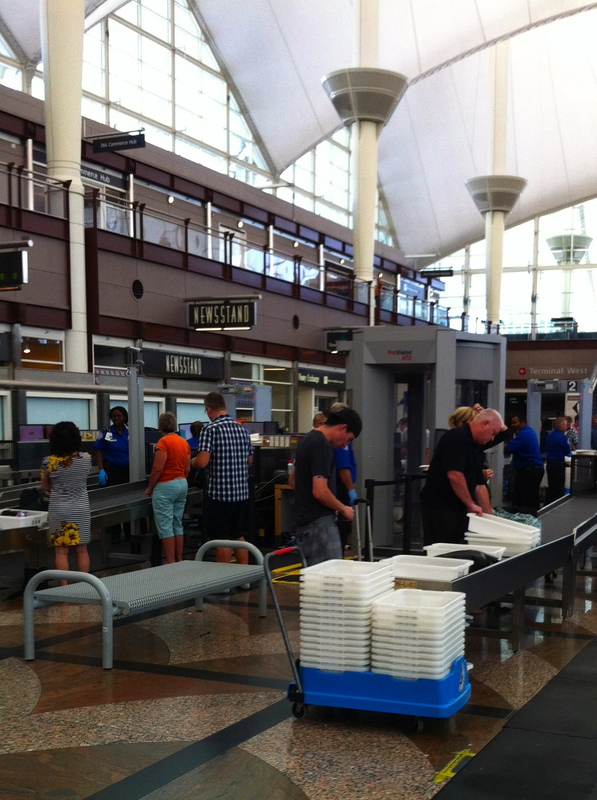 Have you spent any time watching an airport TSA agent? They have complete and utter disdain for humanity. Why shouldn’t they? Have you met people? Most people are confused. They don’t read signs. They can’t follow directions. They’re completely bewildered in the airport. They’re unwilling and unable to adapt. Even now, nearly 11 years into a post 9/11 world, people still don’t know how to get through this enhanced airport security. They remain unhinged. Oh. They mean well. They try. But, TSA agents shout so many instructions and there are always newfangled scanning machines and it’s all so darn confusing to the average person who only occasionally travels. The problem is that there are A LOT of those type of travelers in the airports slowing down the screening process and annoying the living crap out of the poor, beleaguered TSA agents. This is why, I believe, they are belligerent. We’re mucking it all up and making it nearly impossible for them to get to their well-earned coffee break. My mother-in-law who, by all accounts, has traveled a great deal got caught up in the security nightmare last week at the Miami airport as we were going through U.S. screening after returning from Ecuador. They asked her to walk into one of those large millimeter wave scanners where you stand with your feet spread wide and place your hands above your head like you’re being robbed while the machine’s arm scans you down to your birthday suit. Apparently, Marlene did it wrong because the TSA agent yelled at her as she exited the scanner. “Do you have something in your pockets?” the hefty and thoroughly frustrated agent bellowed. “Just some Kleenex,” my mother-in-law replied quietly. This forced another TSA employee to roll their eyes, get up from their stool, and reset the machine that my mother-in-law had obviously disturbed. Now, most of us would not think twice to leave a piece of paper in our pockets because with the traditional metal detectors we’ve been used to for years, a mere piece of paper would not be an issue. “Empty your pockets” used to mean take the metal out of them. Now, it means take everything out…hence, the need for flippant comments when explaining in excruciating and obnoxious detail what the term “empty” means. Having carefully watched this scanning process while waiting in endless lines at the airport, I noted that approximately 1 in every 5 scans may end in a recalibration because someone either touched something or left something in their pockets. That’s a fairly high percentage of people messing with the process and, consequently, a fairly lucrative opportunity for overt sarcasm and disdain for humanity. Where else could I get paid to show how much people annoy me? So, you see, I might have found a better alternative career for myself. I’d thought about writing some sort of book or something, but a job with the TSA might be more therapeutic and beneficial. I could take out my endless frustrations with clueless humans in a public setting. Then, when I was depressed by the sheer number of perplexed and befuddled individuals wandering through this great nation, I could retire from the TSA and write a book about my experiences. Seems as if I’ve finally found both my calling and my book opportunity. Hallelujah!